No casualties were reported among civilians. On Thursday morning, Donbas Russia-backed militants shelled the residential areas of Maryinka, Donetsk Region from the multiple-launch rocket systems Grad-P, head of the Donetsk military-civil administration Pavlo Zhebrivskyy reported Facebook on 15 June. "Today, at around 7 am Kyiv time, militants shelled Maryinka again, this time from Grad-P (Partizan). 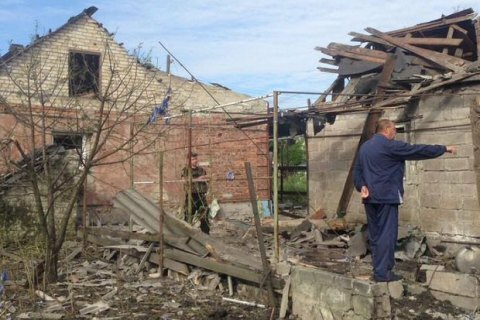 At least three houses were badly damaged at the streets Telman, Matrosov and Ordzhonikidze, according to Maryinka district authorities. No casualties were reported among civilians," Zhebrivskyy wrote. A commission is making an on-sight inspection of the impacted area to document the damages and see which assistance is needed for local residents. At around 11 pm on Tuesday, the terrorists from the occupied Horlivka shelled the residential quarters of the village Sukha Balka. A 52-year-old local man was killed as a result of a direct hit of enemy artillery.